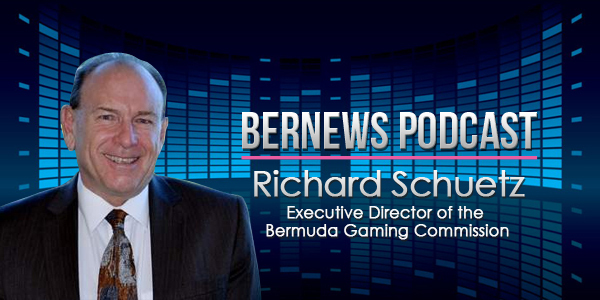 In the latest Bernews podcast, the executive director of the Bermuda Casino Gaming Commission says using Singaporean gaming legislation as a model has slowed down the process of bringing a casino to Bermuda. Richard Shuetz told Bernews that the Commission had drafted more than 40 amendments to the legislation that was passed in 2014 and that he was talking to the new Tourism Minister, Michael Fahy, about the issue. “I have actually made a large number of changes. The selection of the Singapore Act to be our model was a little bit strained,” he said. The Singaporean legislation took seven years and at one stage involved more than 190 regulators and cost $30m, he said. And he added that many of the changes he has recommended were based around language, but he said that Singapore model meant looking at “every contract, every employee”. On other issues, Mr Schuetz was sure that a plan for the protection of the vulnerable would be in place before a casino opened in Bermuda and said a plan was being drawn up to ensure suitable training was available for Bermudians. Mr Schuetz said he felt it was unlikely that Bermuda would see a casino operating before the America’s Cup and he said in terms of revenue generated, that the Commission would recommend a 10 percent tax on casinos which would put Bermuda in a business-friendly environment. You can also download the episode in MP3 format here, view past podcasts here, subscribe via iTunes, access podcasts via TuneIn, or download the Bernews app and enjoy advance listening, with each episode available for download directly to your phone or tablet earlier than it is released on our main site. The eyes of the world will be on Bermuda in 2017. I hope there is an alternative option – whilst we await the builds. This is a huge opportunity lost if we cannot offer gaming next year – a nice boat is the obvious answer at a marina ! How much is the “Gaming Commission” cost us before we even open a casino ? there will be no casino gaming for the AC 2017 because no new hotel is planned to be completed until after the AC. I’m really psyched for gaming…. can’t wait till the already strained working class looses more of their money, really going to help the stability of this island! Perhaps this would be a good time to help start a campaign to caution and educate the public on how to be responsible with this new form of entertainment. Also the government needs to think about having free rehabilitation for anyone that needs it when it comes to gambling. 100% with you there innna… of course your mean ALL gambling???? you know like the kind that makes it easy to pop in (still dressed in your pajamas) and make a quick bet. The kind that don’t have a dress code; or any code at ALL… I’m sure your concern for the “strained working class” includes that form of gaming/gambling….. Love the radio ad that has the nice jingle in the background informing me on how I can come on over and make a bet for as low as a few dollars and walk out with hundreds.. its just that easy… How’s THAT for stability; because I’m SURE you are referring to that form of gaming as well??? Erm people can gamble today at many locations. Mark Bean the leader of the opposition has a gambling shop ! Your bogey man fear is unfounded. Lies and Slander! Marc, would NEVER be involved in a gambling business especially one involved in the heart of a working class neighborhood. Why cant we be up in time? Well then get us someone who CAN! I say let’s all march on Government and demand his resignation. He needs to see us all at Cup Match, as we know how to do it right! We need a BERMUDIAN in there to guide them with the time line for America’s Cup. Where is our new Minister and where is Bob Richards as this guy is costing us all money for no results! Its time to rise up again Bermuda! because the new hotel will not be completed until after then AC. I don’t believe that the ground has even been broken yet. The Singaporean casino legislation as a model,eh….7yrs and $30 million dollasrs too,huh…..Why not use their educational model that successfully serviced the needs of international business or is that not the direction we need to be concerned with? Casinos will provide us with long term albeit low skilled employment? I guess we should leave the problem of importing professional, highly paid guest workers alone.. We have more important matters to tend to like opening up some gambling games…Am I the only one who sees something wrong with this picture? This is the same excuse Schuetz gave 6 months ago. What has happened since then? How long does it take to draft 40 amendments and get it through Parliament? I don’t get it. I thought the number one priority was creating jobs for Bermudians not a long-term job for Schuetz!! Surely it is not this difficult to have a few casinos at hotels to improve entertainment for our guests and locals. We in Bermuda make everything so unnecessarily hard. Let’s see if Dunkley and the boys can figure this out for the America’s Cup. He says he has drafted the amendments but has had to deal with three ministers in four months. Listen to the podcast! Seriously. The Ministerial change happened in the last 6 weeks not 6 months!! Poor excuse! I would imagine 41 amendments does not happen overnight? Dunno, I’m not in the business but it seems a tall order to get that done properly in a few weeks? Simple solution at no freeking cost. Open Crown and Anchor houses from eat to west or at venues. why do we not know how much the Gaming Commission is costing Bermuda taxpayers? how much is Mr. Shuetz being paid? the staff? training expenses for commissioners? etc…. This man is just dragging it out to serve his own $$$$$$. Approach the MEN in vegas the Casino will be open for Christmas.